The 24/7 fast-food drive-thru pace of traffic to and from 333 Pleasant Avenue has fallen off. We’ve had no arson or death threats or mob menacing since June. No one’s tried to kill our dog recently. Several of Pleasant Avenue’s more responsible landlords, aware we were besieged, have come down hard on their drug trafficking tenants. (Thank you, folks), and code enforcement of Pleasant Avenue’s abundant Section 8 rentals has acquired teeth under Herkimer Mayor Tony Brindisi. Our surveillance cameras have also helped lessen daytime criminal activity after several malicious trespassers and slanderous harassers, drug trafficking’s skirmishers, were publicly embarrassed on the Internet. The street is now as quiet as it should have been when we moved here 18 months ago. It’s seems almost pleasant. And had it always been this peaceful, we’d be content. But it wasn’t. Some of our criminalistic neighbors felt empowered to try to terrorize us, having no idea who we are or who we know. (I’ll be writing a series about these outrages on my muckraking blog.) Unfortunately, the most depraved of Pleasant Avenue’s drug thugs are still here, brought to heel for now, but awaiting their opportunities. There’s a sense of red eyes glowering from porches when I walk past some houses. Sadly, there’s compelling evidence that the illicit economy supporting Herkimer’s drug scrotes is still bustling, its business model changed from that of brazen 24/7 retail pickups to stealthy nighttime deliveries. It’s aided and abetted by Herkimer’s Section 8 slumlords, who’ve helped make Pleasant Avenue a drug dealers’ haven. Despite the falloff in retail pickups, Herkimer’s Pleasant Avenue still needs a traffic cop: 162 significant motion events in 24 hours caught on video, and 113 in the 12 hours from 1730 – 0530. This is a small residential street in a village on the Mohawk. On parallel Eureka Avenue, one could safely consume a six-pack at high noon on a chaise lounge mid-street and never be bothered by a car. So, what’s up? We’re not the road to New York Turnpike. No wonder the street had to be repaved. Analysis of our street camera feed for the 12 hours from 1730 to 0530 on October 23 – 24th shows 29 significant motion events at or related to 333 Pleasant Avenue, tenanted by Joyce and Douglas Barton, another 24+ issuing from the parking lot of 232 – 234 Pleasant Avenue, and 11 in and from the driveway of 335 Pleasant Avenue. There’s also much coming and going from 328 Pleasant Avenue, despite the recent best efforts of its owner. The peak period was from 1854 to 0302. These are the classic signs of a drug neighborhood. 333 Pleasant Avenue – The Joyce and Douglas Barton House. The above video captures a series of arrivals and departures from 333 Pleasant Avenue, Herkimer, on 10/13 – 10/24, ending at 0049 hrs. There are many more, but this sequence is typical of nighttime traffic to and from that address on most nights. In this clip, flaring, irregular light from the house emanating into the street at 2319 hrs signals the start of the night’s core activities. (Hopefully the owners have fire insurance.) When a car arrives at 0006, there appear to be at least five people on the porch. The car is met by a figure resembling that of Joyce Barton, and departs 6 minutes later at 0012. This appears to trigger a series of events, with a vehicle leaving the Barton driveway a few moments later at 0033 and returning at 0049, prelude to later such activity from the parking lot of 332 -334 Pleasant Avenue. Parking lot, 332 – 334 Pleasant Avenue – Jay Smith Rental Properties – At 0222 a vehicle crosses the street to the driveway adjacent to 333 Pleasant Avenue and pulls out of sight. This is the first of at least six vehicle exits from the 332 – 334 Pleasant Avenue parking lot through 0257 hrs. (The camera captures the headlights of vehicles exiting 332 – 334. The vehicles themselves can only be seen if they turn left down Pleasant Avenue. Two vehicles appear to be primarily involved.) 341 Eureka Avenue, a rental also owned by Jay Smith, shares the same parking area. The Google camera truck either never photographed Pleasant Avenue or vanished doing so. 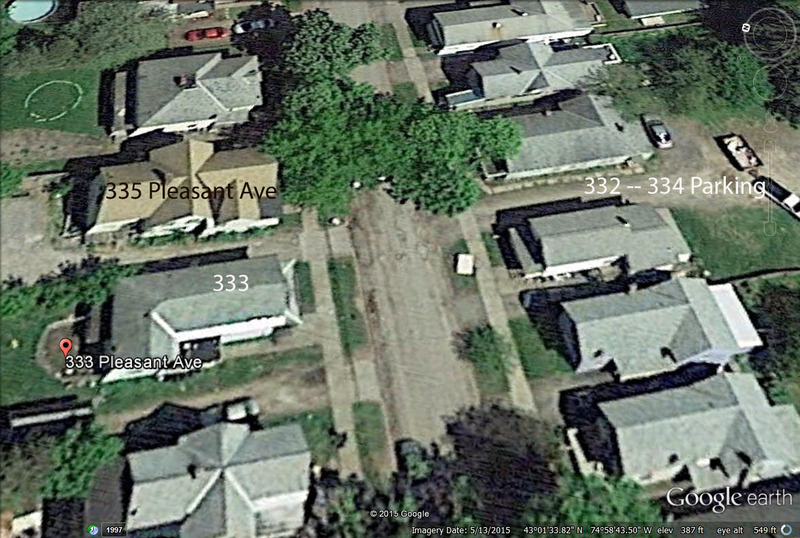 But as can be seen from the satellite image, the driveway of 335 Pleasant Avenue way adjoins 333 Pleasant Avenue. The 335 Pleasant Avenue driveway is easily accessible via 333’s rear patio. 335’s driveway is a straight shot from the 332 – 334 driveway, as seen in the video clip. It would be very easy for people at Herkimer’s 333 Pleasant Avenue to access a vehicle parked at the base of 335 Pleasant Avenue driveway, hidden from the street camera. Below is the unedited footage of motion events trigger our camera for the 12 hour period of 1730 – 0530 on 10/12 – 10/14 2015, from which the brief excerpts above were drawn. I don’t have the resources for sophisticated pattern and facial recognition analysis of the traffic and people bustling up and down the street. But maybe you do. Previous Previous post: Why farm chickens in our yards?